Since Faith is at camp this week, I only have one kid to feed. And while Ben eats a *lot*, I wasn't entirely sure I would have enough blog material for the week, especially if he gets stuck in a food rut. My lovely husband came to the rescue with the suggestion "You could make lunch for me, maybe your readers are interested in bentos for adults." While I think the initial suggestion was a bit self-serving, he kind of hit on a good idea. So while Faith is gone, we'll attempt "feeding the husband" as a theme for the week. 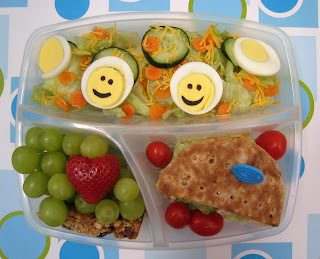 For lunch, Shaun had a salad (lettuce, cucumber, carrot) with shredded cheese & happy boiled eggs, along with baby grape tomatoes to add in at the office. For the time being, they are making sure the sandwich stays put. Dressing was packed in a separate container. He had a chicken salad sandwich with lettuce on Nature's Own Multigrain Sandwich Rounds (cut in half to fit in the box), the last cherry-chocolate chip granola bar, a bunch of grapes, and a bit fat strawberry for color. The box is from Super Target a couple of years ago, but a friend of mine told me they have them again with the picnic supplies. The lid has a built in knife & fork, so it's all one piece. I know they are less than $5, maybe $3.99? Either way, it's a perfect box to give bento a shot for grown ups without spending a fortune to get started. great idea!!! I pack lunch for my hubby and I and am always looking for new ideas!!! This is awesome, and I love it that the strawberry looks like a heart. NOTED EARLIER...BUT THE STRAWBERRY IS A HEART....HOW NEAT! I saw this exact same box at Target this weekend and my live in boyfriend who I pack lunch daily for wanted one too. However it seemed a bit on the small side for his large appetite. I just found you blog and I love it so much I became a follower and posted about your site on my blog. I will definitely be stopping by frequently for inspiration! Do you have a button that I can add to my blog? I would love to let other readers know about you! Yes! That is so ironic, I just had a friend make one this afternoon, thinking "I really should have one!" Let me get my little guy to bed and I'll add it for you to grab. What great ideas! I feel like I am always making the same old boring things for lunch...so thanks for the ideas! I bought one of these today at Target! I paid $2.99... pretty good deal. I also bought a "salad" one that had a container for dressing on the top as well as the built-in silverware.